I am a lover of the cinematic arts, and of guns and firearms. Therefore, I absolutely adore it when these two passions coincide. There are some amazing films out there which incorporate firearms, and this list is of our top 5. Some of them are more accurate in portraying realistic use of firearms, and some are not, but all of them have guns firing and cases dropping pretty much throughout the entire feature. These are not ranked by any specific order, and they are full-length features. Maybe we will get into short films another time, but we’ll start with these since they are more well-known Hollywood movies. Heads up – SPOILER ALERT! Gun Fu has been around since the later 1980’s, yet it was the John Wick franchise (2014 – ) which made it positively explode onto the big screen. It is not an institutionalized and recognized martial art, which means that you won’t be able to go and actually study it at a dojo or firing range. John Woo came up with the style, and Jonathan Eusebio (fighting coordinator for John Wick) took it up a notch. It was one of the most refreshing and original things that cinema had seen in a long time. 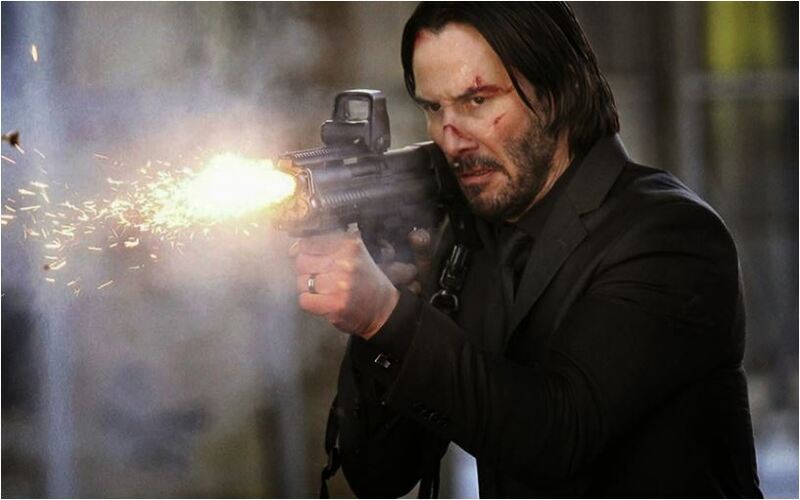 Whereas most action films rely on one major method of fighting (firearms or hand-to-hand) and keep the other secondary, John Wick blended them both in a marvelous way. You just can’t take your eyes off of it. It has been described by Chad Stahelski, the director, as being a combination of “Japanese jiu-jitsu, Brazilian jiu-jitsu, tactical 3-gun, and standing Judo.” Now that is a lot to get done, but Keanu it up for the task. The film would have been a tremendous flop if the fight scenes weren’t written and performed properly, and thankfully it was not. John Wick: Chapter 2 came out in 2017, and I am quite ashamed to admit that I have not seen it yet. Life happens, you know? Gun Fu is all about maximizing the use of a weapon within a martial arts setting. This means fast reactions, quick drawing, and accuracy while engaging in rapid fire. Anyone who has shot a gun knows how difficult this can be, and this is precisely why Keanu trained for months in preparation for the films, and why we love them so. The fights can (sort of) be broken up into long range, short range, and intimate range, where different methods and techniques are used for each of the encounters. The films did a great job at blending all three, so what you get is a wonderful array of kicking, punching, firing, grappling, and one hell of a body count! Cinema is about entertainment, and the John Wick movies are as entertaining as they come. It takes a very skilled and dedicated crew, whether in pre- or post-production, to get a movie like this right. No special visual effects, no sticking to the (tentative) rules of screenwriting – it is simply fun. As for the portrayal of guns, it seems fairly accurate. Obviously, this is still Hollywood, but Keanu trained long and hard with masters of the 3-gun tactical craft, and the results do not disappoint on any level. Films are mostly make-believe. It’s why they are so entertaining, and it is why we keep coming back to them. The John Wick movies will undoubtedly stand the test of time – in my opinion, anyway – because they are based on a real made-up martial art called Gun Fu. And they did it in the best possible way. An action film through and through. 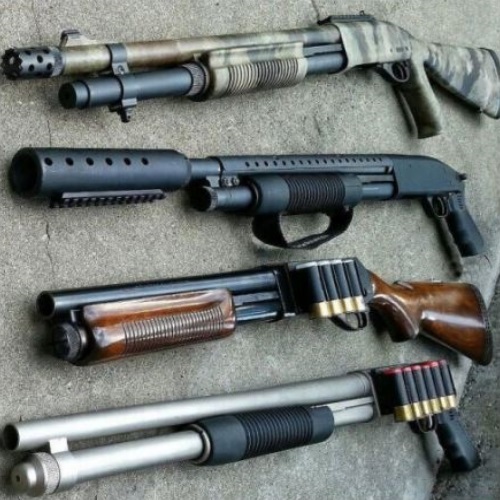 “That’s one firearm for every 12 people on the planet. The only question is: How do we arm the other 11?” asks Yuri Orlov in the opening scene of Lord of War. When this film came out in 2005, it became an instant classic. I am not a fan of everything Nicholas Cage does – I mean, what the hell, Wicker Man?… – but this is one of those times where he was right on the money. He fits the role perfectly and it suits him to a T. Also let’s not forget Jared Leto and Ethan Hawk, who are both also fantastic in the portrayal of their respective characters. It’s more than just a guy film. Sure, Lord of War has a lot of action in it, lots of explosions, lots of guns and weapons of all kinds, and even several scantily-clad women – but there is also a real tale being told in this feature. One which reflects (in some way, anyway) the state of things in the real world. And this is why it caused such a stir when it came out. Making a gun runner into an anti-hero; making you actually root for him in some scenes; following him with open eyes and ears to see what his next move will be – it’s good cinema and good storytelling. This film was very loosely based on the life of the alleged arms merchant Viktor Bout, though Viktor himself poo-pooed the film, and said that Cage deserved a better screenplay. I am not about to argue with anyone who has earned the title “Merchant of Death”, but I do feel that the screenplay is rather good, if I may say so myself. As for guns used in the film, there are so many to choose from. It is a pleasure to watch, even if the depiction is not perfect at times. You make some concessions and allowances for the sake of entertainment. Also, it has one of the finest opening credits scenes in the world, in my opinion. The life of a bullet, told from the bullet’s POV, brings us along for the ride of a lifetime. From its initial production to its final (and rather unfortunate) destination, we get a glimpse of how bullets are being used on a daily basis. 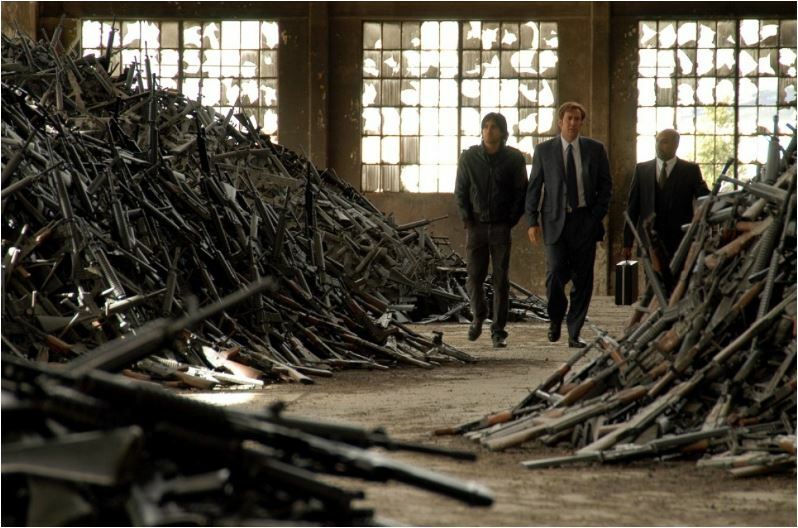 The reason that this film makes this list, and the reason that it is one of my favorites, is because of its accurate portrayal not only of gun use and weapons (in some scenes), but of the situation in ongoing bloody civil wars around the globe. Some of the scenes are pretty difficult to watch. 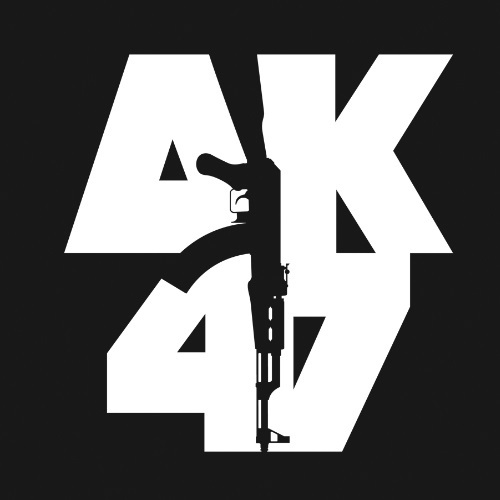 There is a beautiful scene where Yuri describes the AK-47 (aka Kalashnikov) rifle, and it is accompanied by music from Tchaikovsky’s Swan Lake. It has such tragic beauty to it, and the voiceover dialogue is absolutely perfect. I would have made some changes to the script if I could, but there is no denying that that is one beautifully constructed scene. It’s short and sweet and it gets the message across in a big way. See? Swan Lake! Not just for guys! I was a wee lad when Heat hit the theatres, but I wanted to see it anyway. Good thing my folks were fans of Pacino and De Niro, huh? 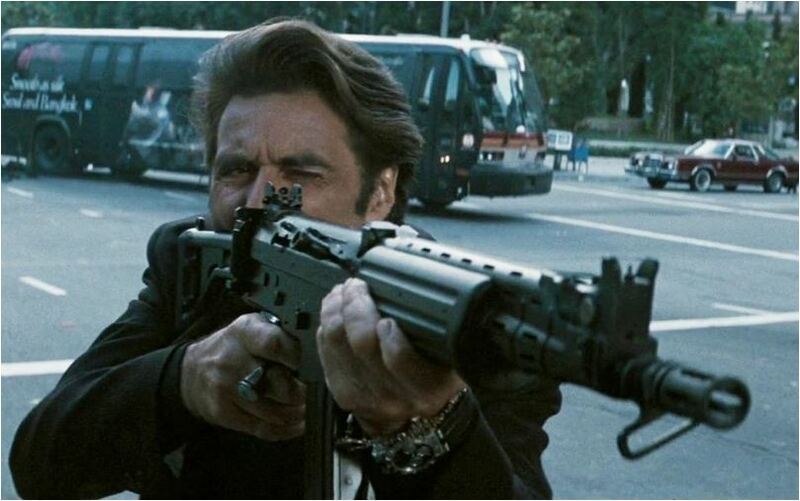 I was too young to appreciate it at the time, but Heat has some of the most authentic depiction of guns and gun-handling techniques that the big screen has seen. The director Michael Mann hires professional firearm advisors in his films, and for the movie Heat he hired former SAS soldiers, so it comes as no surprise that the result is nothing short of fantastic. This movie does a great job of showing how automatic gunfire is used for cover and escape. It shows the importance of skillful and immediate reloading, especially under fire. It shows the loneliness of life outside the law. And last but not least, it shows what happens to you when you mess with Lieutenant Detective Vincent Hannah of the LAPD. One of the best things about this film is that – much like in The Godfather Part 2 – Pacino and De Niro don’t really meet. They do, only once, in one of the most intense scenes of the film. That coffee-shop scene is short. There are no guns drawn, no explosions, no hand-to-hand combat – yet you cannot look away from those two as they finally face each other. It is a great scene because there is no action in it. The scene is so charged, electric, and rife with tension that it really doesn’t need it. We – the viewers – are already there. Another thing worth mentioning – since it is awesome – is the proper use of the Mozambique drill at the beginning of the film. This is a technique which is meant to stop a target cold, and it sure as hell does. Two shots to center mass, one shot to the head. Boom. Sure, the character who died was innocent, but who cares? We get to see (and hear!) Val Kilmer as he puts an end to that dude’s miserable experience we call life. Incidentally, speaking of hearing and seeing, there seems to be an increase in volume when the guns are pulled and the action starts flying. This is wonderful with juxtaposed with the film’s somewhat gentle use of volume during scenes of dialogue. This is not the first and only time that Michael Mann has shown us how guns are handled. As mentioned, he does his research and trains his actors well. This is why his movies look so damn good. When you invest in proper combat training in pre-production, it usually pays off. Good thing he had the budget to get it done, huh? I am a big fan of Kubrick and his work. I loved A Clockwork Orange, Barry Lyndon, The Shining, and really most of his filmography minus Eyes Wide Shut. Now, maybe he was the one who shot the moon landing of 1969 in some studio in Virginia, and maybe he wasn’t. I have no real position on that and am not a conspiracy theorist in general. But I’ll tell you one thing: he sold me on the horrors of Vietnam and of humans at war in Full Metal Jacket. “Goodbye my sweetheart, Hello Vietnam”, sings Johnny Wright in the opening credits of the film. That is too damn right. This film is split into two. The first part tells the story of a platoon of Marine recruits undergoing basic training at Parris Island. The second tells the story of Joker, a character from the aforementioned platoon, who engages in actual combat after being deployed to ‘Nam. 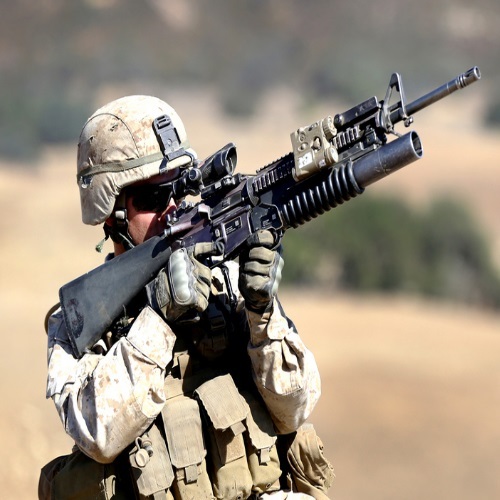 We get to see what war and combat training can do to ordinary people, and it is not an easy thing to take in, despite its entertaining appeal. Kubrick was very clear with his message in this one: war is not cool, people. In fact, it is the very definition of hell. This movie is rather light in its use of firearms, compared to the rest of the films in this list. The second half certainly has some, but the first half is limited to combat training, plus one gruesome murder-suicide. Nevertheless, it makes this list big time, for being a real portrayer of war and its damaging properties. Full Metal Jacket makes use of rifles, machine guns, handguns, grenade launchers, hand grenades, and even an M72 LAW anti-tank rocket in the telling of Joker’s story as he plays his part in the war. At the end of it, you are left with one serious conclusion: once you take a human life, there is no going back. The best scenes, weapon-wise, are the ones where the base is under attack in a reenactment of the Tet Offensive of 1968, and (obviously) the final sequences of the film where the squad is up against a Viet Cong sniper, and where Joker finally makes his first real kill. The discussion on whether or not to shoot the incapacitated sniper is one for the books, and it is another part of what makes his film – and its message – so important. Ah, The Matrix… the first one rocked. It has been nearly 20 years (can you believe that?! ), and it still rocks. The visuals, the premise, the action, the cinematography. They were and still are, for lack of a better term, freakin’ awesome. And the other two?… well, they weren’t so hot. Not in my opinion, anyway. I wanted to love them. Really, I did. I went to the theaters expecting the best, expecting to be blown away to pieces, and sadly it did not live up to the original on any level. Shame. But enough about the sequels! This is about the original. And it certainly is an original, however you choose to look at it. When it came out in 1999, it was totally in the right time and place. At the turn of the century and the millennium. What a time to release a mind-expanding and action-packed flick like The Matrix! Are there flaws? Sure. What film doesn’t have flaws? But all things considered, it is a really entertaining film, full of rich, creamy firearm goodness! Now, to be clear, you are not going to get actual depictions of anything close to real in a movie where the protagonist can actually dodge bullets. 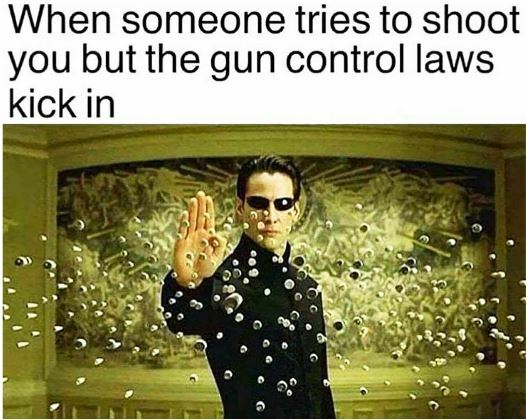 But what you will get is, to quote Neo, “Guns. 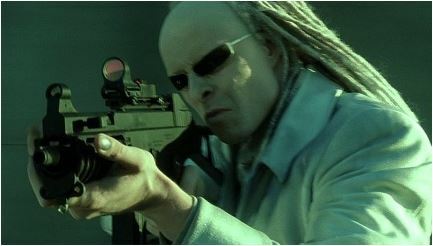 Lots of guns.” From the opening scene where Trinity escapes police officers and Agents, to the showdown between Smith and Neo (“You’re empty. -So are you!”) towards the end of the film, this feature is packed with weapons of all kinds, as well as a fair bit of martial arts thrown in for good measure. It very much resembles John Wick’s Gun Fu, with its switching between firearms and hand-to-hand combat, though not exactly in the same elaborate way as it is portrayed in that film. You can say that John Wick attempted to perfect the style which The Matrix laid out. One can certainly say that John Wick’s style was inspired by certain scenes in The Matrix if nothing else. And that is saying a lot. I feel the whole love story between Neo and Trinity got really old, really fast. As did the “Messiah” thing, which was unfortunate, because it could have been handled with more subtlety. Far be it from me to judge those who have released a full-length feature, but it just seems to me that the whole thing could have been handled better. In the first one, it works. In the other two installments… bah. It just takes up time and mental energy. If you want to look at a realistic portrayal of guns and weapons, this is not the film for you. But if you want to see Agents fighting, bullets flying, cases falling, and armed guards getting blown to smithereens – this is certainly a movie you owe yourself to watch. And thankfully, it stands the test of time. It is written well, executed properly, and as a standalone film, it really works.